This amazing collection of wisdom from 30 top experts from North America and around the world was created by Bob 'Idea Man' Hooey to support the CAPS Foundation. 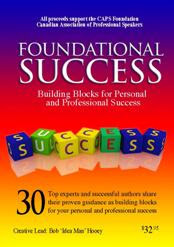 Visit: www.foundationalsuccess.com today and safely purchase your own copy for only $20. $19 of each purchase goes directly to the CAPS Foundation. $1 is used by our CAPS National Office to cover credit cards and processing. Tell your friends and family to visit as well. Share this with your colleagues and your clients so they too, can build some foundational success.